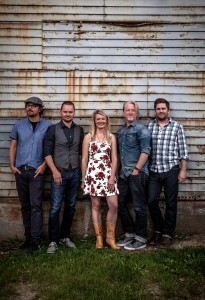 Gaelic Storm members (from left) are: Ryan Lacey, Patrick Murphy, Katie Grennan, Steve Twigger and Pete Purvis. A hurricane of toe-tapping jigs and reels. A blizzard of tear-stained ballads. And of course, a flood of drinking songs, love songs, dance tunes and between-song stories that cover all the elements of the human condition. That’s the forecast next Thursday, Jan. 24 when Gaelic Storm strikes Geneva. The longstanding Celtic rock band will be performing its high octane brand of traditional and contemporary Irish, Scottish music at the Smith Opera House. Gaelic Storm takes a blue-collar, hard-nose approach to touring, consistently traveling the United States and internationally over 200 days a year, forging a unique path in the Celtic music world. The band includes co-founders Patrick Murphy (lead vocals, harmonica, accordion) and Steve Twigger (lead vocals, guitar), Ryan Lacey (drummer and world percussion), Pete Purvis (Highland bagpipes, Uillean pipes, Deger pipes and whistle), and Katie Grennan (fiddle and vocals). The dedication to live shows dates all the way back to the mid-1990s, when Gaelic Storm surfaced as a pub band in Santa Monica, Calif., where Murphy, then a recent transplant from Ireland, was the manager. By the end of the decade, the musicians had appeared in the blockbuster film “Titanic,” where they performed as the steerage party band. This laid the groundwork for a career that would eventually find them topping the Billboard World Chart six times, making appearances at mainstream music festivals, and regularly headlining the largest Irish festivals across the country, all the while gaining a reputation as a genre-bending Irish rock band whose songs mix Celtic traditions with something uniquely creative. “We come up with new music all the time. Of course we integrate Celtic flavor but we also love folding in other genres and forms of inspirations,” says Lacey, a California native who keeps the beat with a globe-trotting range of percussion instruments. English-born Twigger, by contrast, comes from a rock background, while Purvis is steeped in traditional Celtic pipes, which he learned in his native Ottawa. Grennan, from Pennsylvania, is just as accomplished in Irish step-dancing as she is in Irish fiddling. Landing a movie gig certainly opened doors for the band faster than had they been left to their own devices, says Lacey, who did not join Gaelic Storm until 2003. But that wave of celebrityhood has passed, and the band’s reputation as talented musicians and performers is what forges their ability to keep going, both on the road and in the studio. To date, Gaelic Storm has released 13 albums. Lacey says everyone in the band would agree that the heart and soul of Gaelic Storm lie in Murphy, a natural raconteur whose stories and personality “drives everything we do.” As Murphy tells it, he’s the kind of guy who can’t brush his teeth or tie his shoes without something weird happening to him. Still, every band member plays an important role beyond their musical contributions, notes Lacey. Twigger, for example, writes a lot of the songs and steers the band musically. Mild-mannered Purvis has a secret wit so sharp it keeps everyone’s ego in check. Lacey seconds as the “stage manager,” keeping everyone on schedule and in synch (he even offers his Chicago home as rehearsal space). And Grennan brings in a new sense of fun and personality. As Gaelic Storm has matured and changed, so too has its audience. Some of the band members have started families of their own, while fans bring their kids and grandkids to shows all the time. So another 20 years? Why not, says Lacey.